Hello everyone and welcome to Tuesday! This is the second day of the week, and now we are really getting rolling on our work. So how many of you really love the warmer weather because it means getting to go swimming and doing fun things on the water like riding on an inner tube? Well guess what? 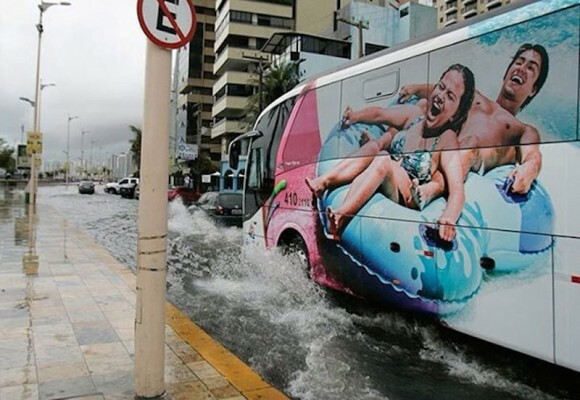 Today’s optical illusion is a special one because it’s all about getting to ride on an inner tube, and it’s pretty funny because it looks like this couple is going from the side of the bus right into a bunch of water! Now that is a serious puddle, and it looks like this couple riding the inner tubes is enjoying it, right? Is that what you all think because that’s what we thought of when we first saw this cool image. Ready for an elephant drawing that is coming to life? Check out this elephant drawing optical illusion, and it looks mad, and determined, as it breaks through the paper and about to climb right out of that desk! That is one talented artist right? We think so too, and we wish we had as much talent as this artist. Today is Tuesday, but we know you all are working hard, and we hope our optical illusions make you all smile and help you get through the week!